Dr. Catherine Rawn is a Senior Instructor in the Department of Psychology at the University of British Columbia. Dr. Rawn is tenured faculty member who specializes in teaching and educational leadership. She is also Chair of the Faculty of Arts Curriculum Committee and the Chair of the Psychology Department Curriculum Committee. 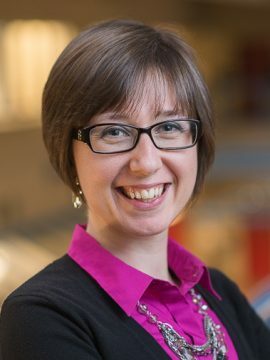 Research interests include educational leadership, scholarship of teaching and learning, collaborative learning methods (peer assessment, teamwork, two-stage tests), technology-enhanced teaching and learning (personal response systems, learning management systems, social media), student evaluations of teaching, program evaluation (TA Training, curriculum), social psychology broadly. Golding, J., Rawn, C. D., Kern, K. (Eds.). (in press/2018). Strategies for Effectively Teaching Large Classes in Higher Education. San Diego, CA: Cognella Academic Publishing. Rawn, C. D., Ives, J., Gilley, B. (in press). Two-Stage exams increase learning and laughter on exam day in classes of any size. Cozby, P. C., & Rawn, C. D. (2016). Methods in Behavioural Research, 2nd Canadian Edition. Toronto, ON: McGraw-Hill. Cozby, P. C., & Rawn, C. D. (2012). Methods in Behavioural Research, 1st Canadian Edition. Toronto, ON: McGraw-Hill. Rawn, C. D. & Fox, J. A. (2018). Understanding the work and perceptions of Teaching Focused Faculty in a changing academic landscape. Research in Higher Education, 59, 591-622. DOI: 10.1007/s11162-017-9479-6. Open access available from http://rdcu.be/wro5. Sandstrom, G. M., & Rawn, C. D. (2015). Embrace chattering students: They may be building community and interest in your class. Teaching of Psychology, 42, 227-233. Krieger, S., Allen, M., & Rawn, C. (2015). Are females disinclined to tinker in computer science? SIGCSE’15 Proceedings of the 46th Association for Computing Machinery, Technical Symposium on Computer Science Education, 102-107. As Educational Leadership stream faculty in Psychology, Dr. Rawn does not supervise graduate students.